Your vacation object: The Holiday apartment is located on a 300 sqm and an enclosed garden property with flowers. The apartment KVA VEL 032 for 4 people located in the same building. The owner lives only temporarily in the house or, but uses a separate entrance. The facilities are at your disposal for common use. Relax outdoor at the terrace with garden furniture. Barbecue possibilities are available. Your holiday apartment: Your holiday apartment offers 1 floor, 2 rooms (from which 1 bedroom), is 42 sqm and can accommodate up to 4 persons. An air conditioning ensures pleasant temperatures on hot days. The entrance is on the 2nd floor and ground level and leads directly in the vestibule. The rooms are divided as follows: Kitchenette with electric cooker (2 plates), refrigerator (freezer), microwave and coffee machine. Bathroom with shower, 1 washbasin, WC and bidet. Living/bedroom with 1 bunk bed. Bedroom with 2 single beds. 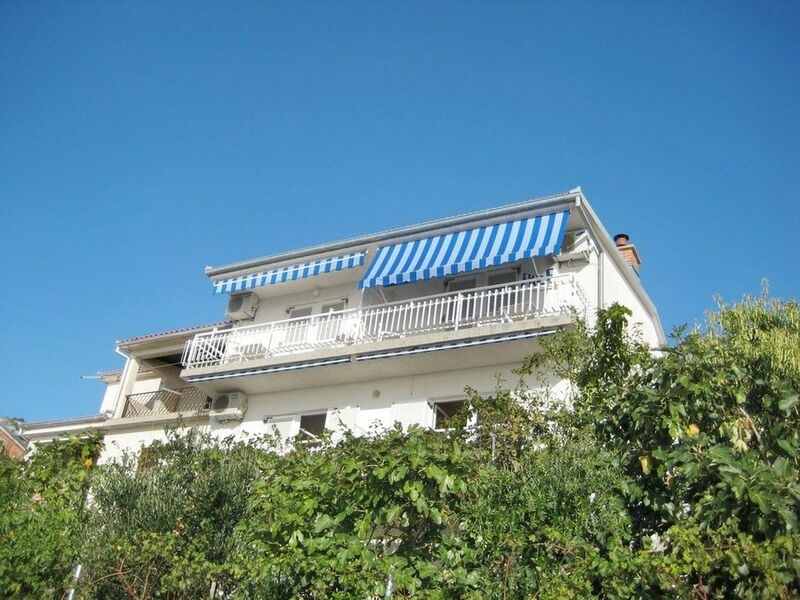 You have access to the 7 sqm, covered balcony with garden furniture. In addition, your holiday apartment is equipped with WLAN- internet access. TV or radio channel can be received per satellite. Pets: erlaubt, EUR 5.00/Tier und Tag. Es gibt vom Zimmer und vom Balkon einen sehr schönen Blick aufs Meer. Die Aussicht von der Wohnung auf die Bucht und die vorgelagerten Inseln war einfach spektakulär. Der Vermieter ist sehr aufmerksam, zuvorkommend und total nett. Hallo waren auch in der Ferienwohnung. Alles super hat uns sehr gefallen einziger nachteil die Hauptstrase unterhalb,sonst alles Topp. Nette Gastgeber und tolles Objekt!